As well as 0.75 miles of the main river. this picturesque stretch of river includes the mouth of the River Arrow and 150 yards of the tributary. Reed-lined banks and underwater pads add interest and shelter for the fish. Banks can be steep in places. adding to the tranquillity, but restricting access for some. 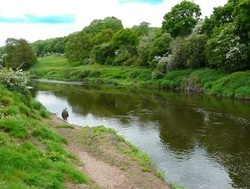 This stretch is very popular for barbel with fish in excess of 15 lb recorded. Also pike to 12 lb. chub to 5 lb. perch to 1 lb 8 oz. roach to 12 oz. dace to 4 oz and nets to 10 lb with a few bigger chub included. Legering 15 mm or 18 mm halibut pellets with hemp feed. or smaller hard pellets. in a blockend feeder in the faster water upstream for barbel. Float fishing. either stick or waggler, on rod and line is excellent for mixed nets of small silver fish on maggots. Casters will sort out a bigger stamp of fish. especially downstream where the depths drop to 8ft. Hemp and ares good in late summer fished down the middle on a waggler. Block-end feeder with maggots cast under far bank tree cover will give a chance of a bigger chub. Below the Arrow mouth on the gravel run is very good for barbel. From Bidford, follow the A439 through Salford and on to Abbots Salford. After0.75 miles. turn left into the caravan park access lane and then left again close to the caravan park entrance. 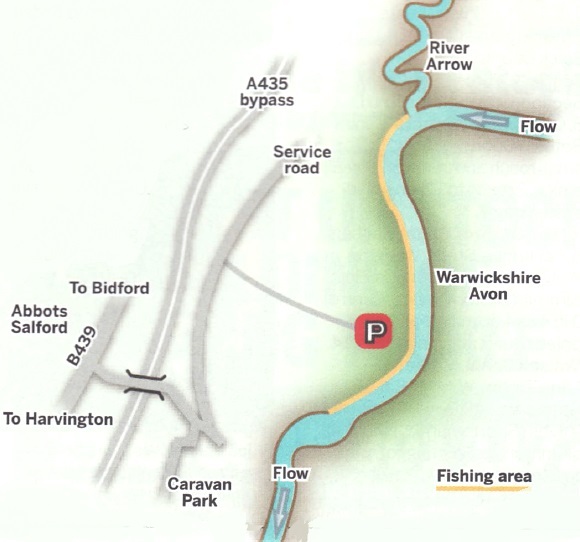 Follow the service road and then turn right through the access gate to the fishery parking.